"I would tear down the periphery-belts of the big European cities, Rome, Turin, these monsters, these ghettoes, which reflect what we have made out of our society. I would destroy all these high-tech buildings, the whole glass-architecture, these barbarian constructions, which are just to justify tremendous wastes of energy." The words above are from the Swiss post-modern architect Mario Botta, and they are particularly appropriate this week as the public consultation for Norman Foster’s controversial 30-storey glass tower at 980 Madison Avenue in New York’s Upper East Side closes. I have followed the New York debate with interest as I live close to one of Foster’s early buildings, the Sainsbury Center for the Visual Arts, which featured on these pages recently. Foster’s futuristic designs always divide opinion sharply, and the director of the New York Historic Districts Council, Simeon Bankoff, has described the proposed addition to the flat topped 1940s building on Madison Avenue as “An atrocity, it flies in the face of any concept of preservation". 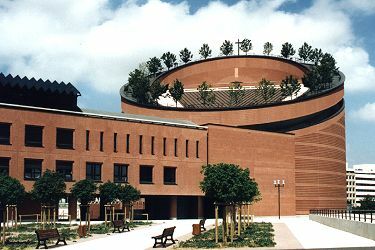 Mario Botta's post-modern designs are less controversial. 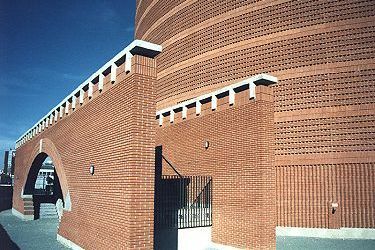 With their debt to Le Corbusier, Carlo Scarpa and Louis Kahn, they grow from simple geometric shapes, and often use brick. His creations include the Médiatheque in Villeurbanne (1988), the San Francisco Museum of Modern Art (1994), and he contributed to the controversial renovation of La Scala, Milan. 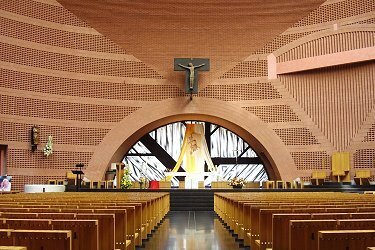 But Botta’s signatures of simple geometry, brick surfaces, and ‘neo-realist’ style are seen to best effect in his dramatic Cathedral of the Resurrection at Evry in France, which illustrates this article. 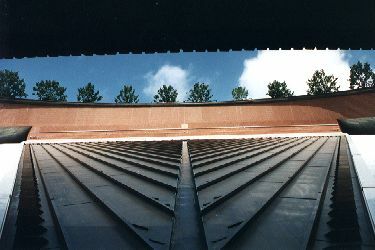 Botta’s dramatic use of surface textures is reflected in the 800,000 bricks arranged in geometrical designs, while the building’s form is a truncated cylinder. There is extensive use of glass between the roof and walls to provide natural light, and the floor of the nave is black granite. The details pick up on the post-modern theme. The tower is crowned with twenty-four lime trees symbolising life (see the header photo), while the east window contains another tree reference. 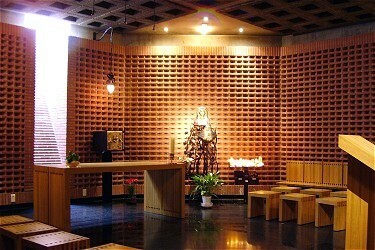 The Christ above the High Altar (see photo above) was made in Tanzania in the early 20th century, and the Virgin is a wooden statue from the 16th century, while sheets of petrified wood from the Arizona desert are used elsewhere. The cathedral was constructed between 1992 and 1995, and the consecration in 1996 reflected the post-modern theme with a performance of Jacques Loussier’s Messe Lumieres. Loussier’s prodigous reworkings of Bach can sometimes sound like ‘elevator music’, but his so called Mass for the 21st century (Messe Baroque du 21 Siècle) is one of his most distinguished works, with its stylistic debt to Carl Orff and Stravinsky. Sadly (or should that be predictably?) this most distinctive of Loussier's compositions has disappeared totally from the CD catalogue, and is exceedingly difficult to find. Any readers with information on availability or re-issue please post below. My money is on Norman Foster’s Madison Avenue tower being built. If it does it would be great to follow the example of Loussier’s Messe Lumieres by commissioning the contemporary music equivalent of a 30 storey glass tower. There is a great tradition of contemporary music celebrating new buildings, ranging from Britten’s War Requiem celebrating the rebuilding of Coventry Cathedral, to Morton Feldman’s Rothko Chapel celebrating the ecumenical chapel built in 1971 by the Ménil Foundation in Houston, Texas. What a great double opportunity for New York, a Norman Foster glass tower and a new music commission – step up to the plate you guys over there on Sequenza21! The Wikipedia entry for Evry is wrong when it says - Cathedral of the Resurrection (only cathedral to be built in Europe during the 20th century). The new Anglian cathedrals at Liverpool (1924) and Guildford (1961) immediately spring to mind. Also the Catholic Cathedral at Westminster was consecrated in 1910, although building started in 1895 - and an interesting sidepath there; Westminster Cathedral actually opened in 1905, but a cathedral cannot be consecrated if it is in debt, and it took another five years to get the largest Roman Catholic church in England and Wales into the black. Thank you for your extraordinary essay above. A small point perhaps but I believe Botta is Swiss, not Italian. I'm not sure where you came across this quotation but I don't think it’s new: I remember his remarks causing some uproar several years ago. It's also interesting that the French - not known for shying away from the architectural avant-garde - have steadfastly refused to allow towering modernist commercial buildings to sully the purity of the Parisian skyline (with the rather obvious exception of the Tour Montparnasse). All other examples of wanton extravagance have been ostracised at La Défense, the business district situated, like a medieval cemetery, firmly outside city limits. And I can think of no better reflection of “what we have made out of our society” than Les Halles – the hideous 70s development on the site of the former fruit & veg market at the centre of the city, which happily, Paris is now planning to tear down and redevelop. Guthry, well spotted - my error now corrected. You are also right, the quote comes from a 1999 interview with Botta in WeltWoche, the German language Swiss weekly. It was in response to the turn of the millennium question - what would he leave behind on the garbage dump of history? PLIABLE mentions Liverpool and Guildford Anglican cathedrals in England. Liverpool is in a Neo-Gothic design, Guildford a kind of modern/gothic (I call it cartoon gothic; the basic forms are there, with none of the detail). Coventry Cathedral, consecrated in 1962 was the first in England (possibly Europe?) in a truly modern style. Basil (later Sir Basil) Spence, Architect, designed a 'plain casket in which jewels and treasures can be placed' (paraphrase). Boasting what I believe is still the largest tapestry in the world (designed by artist Graham Sutherland; some of his many cartoons are often exhibited), and glass work by John Hutton, John Piper and others. Liverpool Catholic Cathedral, designed by Frederick Gibberd, consecrated 1967, is also modern, suffering now from false economies made in the concrete when it was built. It is also a dramatic modern circular design, facetiously nicknamed by locals 'Paddy's Wigwam'!